It’s a good day for travel. Wolfgang graciously offers to help me back up the Perfect Tow Vehicle to hitch up the Casita. “No, It’s better if I do this by myself. Thanks anyway.” He looks uncertain so I add, “If I need any help, I’ll come and get you.” We’ve already said our goodbyes, being good boondocking neighbors. I’m excited about getting on the road today, going west to Yuma. Breaking camp goes quickly. As I back up a few inches in order to retrieve the leveling blocks and chocks from under the tires, I see Rick leaning against his Jeep up at his campsite. He’s soaking up some sun with Lady at his side. He lifts his arm and shouts back, “Bye, Sue!” I climb up into the PTV, fire ‘er up, and we’re on our way! We make an important stop before leaving Ajo. He tells me it’s ten dollars for both, and asks me where in South Dakota I’m from. I explain that I don’t live in South Dakota; I just use it for my residency, license plates, and mail forwarding. “Oh, I was wondering because I’m from Idaho.” We talk about Idaho for a while. He makes sure I’m all set to dump and get water, and wishes me safety on the road. The crew knows this isn’t a trip to the grocery store. They’ve settled in. Spike’s on the bench seat and Bridget’s on the pillows on the floor by my seat. 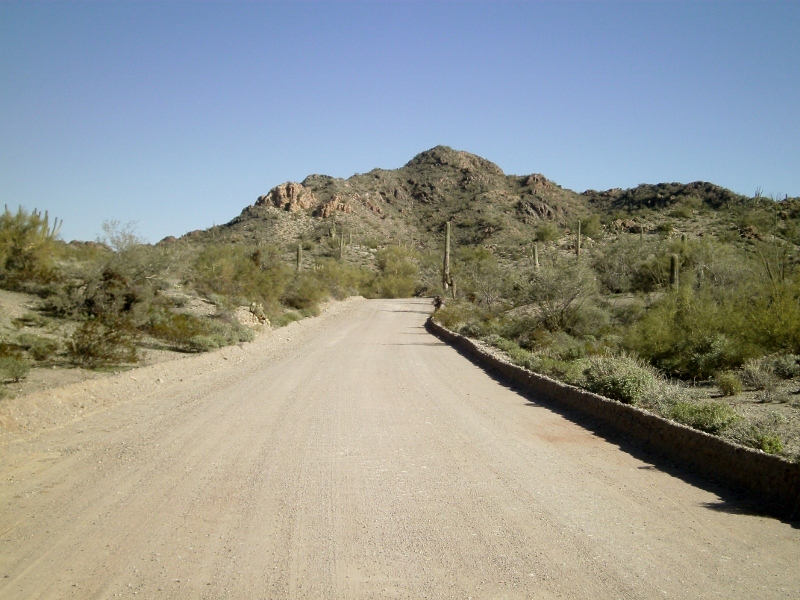 We travel north on Highway 85 for about an hour, then turn west at Gila Bend, taking Interstate 8 to Yuma. I’m shocked when I see a road sign “San Diego 224 miles.” Gee, I didn’t realize I was that close to the Pacific. I keep the speedometer at 55-60 mph all the way. We stop at a rest area about halfway; the crew socializes in the “Pet Exercise Area” with a young Cavalier King Charles Spaniel named Rascal. Back in the PTV, both Bridget and Spike fall asleep and stay that way for the rest of the ride to Yuma. Yuma makes a dramatic entrance when you approach her from the east. The interstate, after crossing miles and miles of flat scrub desert, suddenly climbs up and curves around some huge rock outcroppings, like the swirl on a soft ice cream cone. Once you reach the crest, Yuma comes into view, spread out like a white blanket across the flat desert up ahead. There must be thousands and thousands of motorhomes and park models, jammed together in tidy rows! I take Exit 7 and after several easy turns on wide streets we arrive at Starlight Solar. I look at my phone. It’s a little after 3 o’clock. We left Ajo at noon. I leave the crew in the PTV and walk over to the office. A tall, young woman is at the counter. I tell her my name and that my appointment isn’t until tomorrow. “Would you mind if I spent the night here?” I ask. “Not at all!” She shows me where to park once some cars pull away. “They’ll be leaving at four.” I thank her and hurry out to the PTV. Spike and Bridget need to get rid of their energy. We walk to the end of the wide street, past corrugated buildings and chain link, a typical industrial park. Spike spots a big, yellow dog and insists on meeting him. 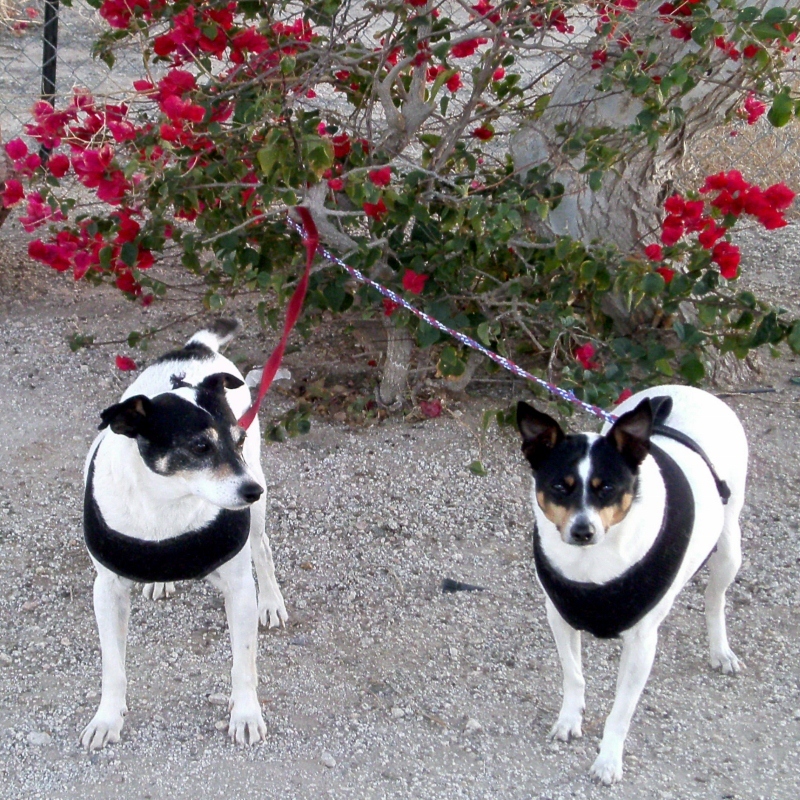 They sniff, wet a post a few times, and prance at each other. I urge us on. I notice lots of palm trees and plants I remember from my years living in Florida. There’s an orange grove at the end of a side street, but I’m hungry so we turn back to “home.” The crew and I eat supper and lie down to rest for a bit. 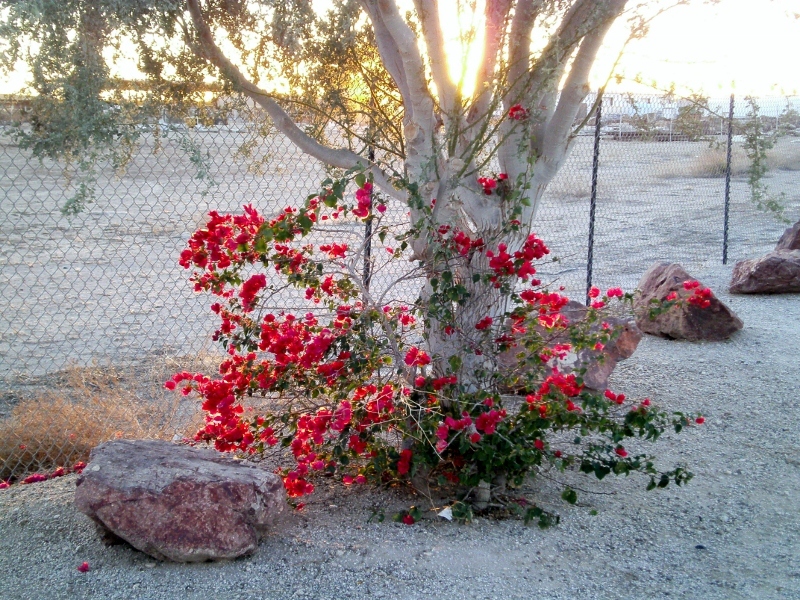 Later I take some photos of a pretty, flowering bush along the parking lot fence at Starlight Solar. The appointment isn’t until noon tomorrow. The Perfect Tow Vehicle waits. Once the solar work is done, the crew and I will look for another place to boondock! Hmmm . . . Will we camp in Arizona or California? This entry was posted in Getting Ready To Go, Simple living. Bookmark the permalink. 44 Responses to Hello, Yuma! I also find it exciting every time I get behind the wheel off to a new place. And I find it equally great every time I pull into a spot where I know I’m gonna be for awhile. Both worlds are great aren’t they !! Yeah, it’s so much darn fun! There is a VFW post north of Yuma that has BLM land right north of it and there are a lot of boondockers who stay there during the winter. If you want to stay in the area that might be worth looking into. You know cute when you see it! I just love reading your blog. You find something fun and/or beautiful every place you go and in everything that you do. Hope they get your solar problem figured out. Tomorrow should be interesting! I love to hear that somebody loves my blog . . .
That plant Sue is Bougainville. So I was right! It’s been a long time since I’ve seen one. I love the rich color. Another interesting day! Thanks for posting! There are so many great places around Yuma to boondock. You might also want to think about going to the hot springs at Holtville, CA just west of Yuma. Good luck with the solar fix tomorrow. There is a lot to see to the west of here in California. I’ve studied maps trying to plan my travels for 2012 and it’s so hard to decide which way to go, what choices to make. Gee, such big problems I have! Sue, I was just reading another blog where they had a problem with their solar not producing as expected. Check out his blog… I can’t remember what gauge wire you are using or how far it is between your solar controller and battery, but maybe this link will help. I appreciate this link tinycamper! Because of Sue, Chuck and I are also considering solar. The more we can learn before we actually spend money… the less money we will be wasting. (I hope!) Thanks Sue for sharing your friends information! Sue, we are glad to know you arrived safe and have a safe place to stay for the night! Goodluck with your solar solutions! My first industrial park camp! Wow! I’ll check it out, tinycamper. Thanks. The distance between my solar controller and battery is a few inches. Bridgette and I stopped briefly at the same rest stop on our way to CA. last week. And by briefly I mean we spent about an hour waiting for her to do her business. We’re homeward bound tomorrow and will wave Hi as we passby. I know all about that waiting game! Have a safe trip. Hope your solar is taken care of today. You should have wonderful conditions to “test” it. I think the sun shines everyday in Yuma and it will be in the 70’s today, going up to 75 by weeks end. Yes, you are close to San Diego. You can go anywhere! Have a great day with your little friends, you have about 5 months before the heat hits but no worries, it can be Ocean or Mountains……..hmmmm, which will it be??? Exactly my predicament: too many great choices! Thanks for the forecast . . . I didn’t know it would be that warm by the end of the week. Great pics of the crew Sue. Love the rhyme. Makes me smile every time I see it. I’ll be very interested to see what the solar problem turns out to be. It must have been doing well enough though to keep you happily boondocking out there in the desert. Back in Elephant Butte the system was doing much bettter than it is now . . . want to get it back up to full power. Sounds beautiful…any updates on the solar? I may have missed something, but I thought you were already using it? I’ve been using my solar but only minimally. It isn’t working to the capacity it should. one day we’ll get to arizona….but until then, we’re experiencing it thru you! thanks! You’re welcome, theresa! Happy to have you along . . .
What is your genre in books when you fire up that Kindle? And still hoping to find out what temp is outside before you and crew need to fire up the furnace? How well insulated is that darn cute trailer? I like non-fiction mostly… personal accounts by people in extraordinary circumstances, like pioneers, soldiers, adventurers, explorers, immigrants. I also enjoy biographies and autobiographies of important historical figures (not pop icons). . .
As for fiction, I prefer historical fiction, but I like any story well told. I’m sorry I haven’t checked a thermometer when turning on my heater. When the interior of the Casita feels chilly, I turn it on. I think it’s well-insulated. The fuzzy walls hold heat..
Glad to hear all is great, again we are living your adventure thank you for sharing I just love the pics. We have snow and cold here in the minus, so its nice to see pics of warm places and beautiful flowers, someday.. Please let us know how your solar panel works out, we are anxious to hear what they say is the issue. Take care and give the crew a big hug from us animal lovers. Sorry I’m late replying to comments. I will tell more about my solar. I wish I could send you some of this warmth. 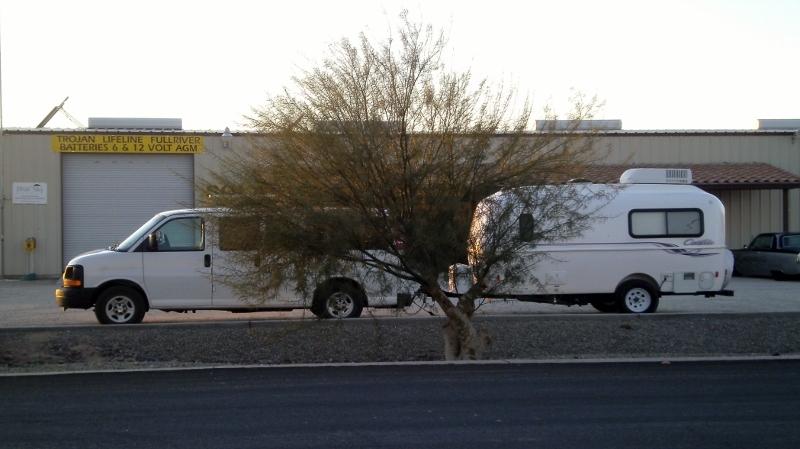 We’ve got plenty of sunshine in Yuma …. WooHoo Sue…looks like your gonna have some nice warm days there in Yuma! Friday,Saturday 77 and 79 the rest of the week!!! Hope all is going well with the solar report and Starlight Solar has ya up n running right. Hugs ta the crew! You’re right on the weather. It’s really warm here. I have really enjoyed your travel adventures. I came across your blog from the Bayfield Bunch and I am now a regular reader. Thanks for sharing with us. I am interested in how your solar check goes; I’d like to learn more about solar power in my camper trailer. Happy 2012! I’m so glad you are a regular reader and that you are enjoying my adventures with my crew. You are not far from a neat border crossing into Mexico, a town called Los Algodones. An absolutely safe and charming place, with great restaurants and taco stands. When I was there 2 years ago after Quartzite I went there for some dental work, a crown, and paid just 200$ for it instead of the $900 here in Florida. Hundreds of US citizens flock across daily for dental work, eye glasses and prescription drugs. There is often a large line early and late. Plus, a great boondocking area is just before the Quechen Indian campground on thge right just beside the border and you can just walk back and forth. Take your passport. I enjoyed the placed immensely and stayed there a week. But, as you turn off the interstate there is a “rolling stop” cop trap. When you get to the stop sign, before turning left on to the road to Los Algodones, come to a complete stop. You are now just inside California and that is the way they augment their invcome. They stopped me in My Jeep pulling a 16′ Casita. Its a desert. I could see for miles. I failed to see the cops hiding behind the rocks to my right as I made the turn. I am interested in the benefits of going to Mexico for medical and dental. I need to go through a bunch of paperwork to get a current passport first and I’ve been procrastinating.. Thanks for sharing all the good information. 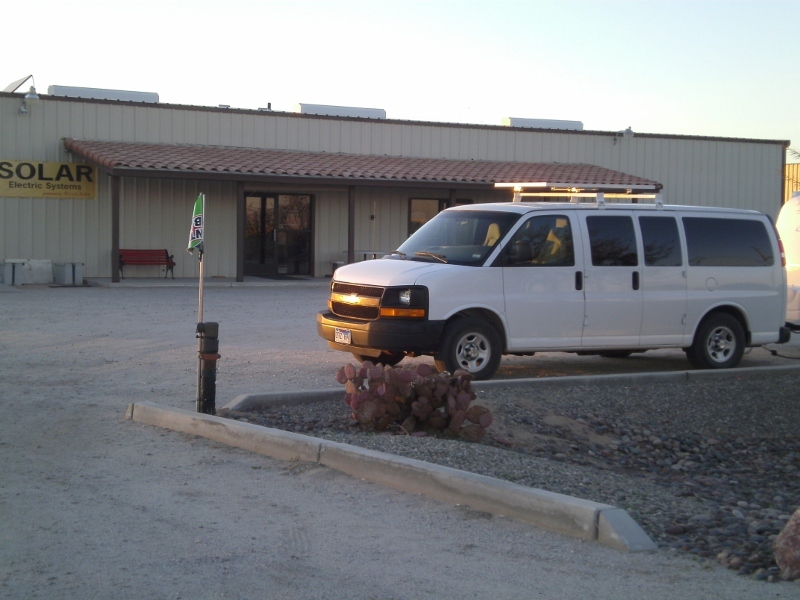 The Qechan Indian owned and run RV campground just at the border to Los Algodones also offers a dry camping special for about $50/week, at the rear of the CG, but still within it. There is no electric or water but you can use the CG’s facilities such as laundromat, hot showers, etc., and is just a 5 minute walk to the border. Some dry camped just behind it and used the facilities anyway. Now I see exactly where you were. So where are you going now my little hobo friend with the big bad protective, vicious dogs and the hobo man that drives you to and fro? I wish I would have trusted my instincts and took care of kitty tonight. Now stupid people are setting off loud stupid firecrackers and the poor stray kitty must be out there so hungry, cold and scared. If KAT is on my property I am going to take care of him. How many of your viewers think that is the right thing to do? Happy New Year, Sue, Crew and Big Bad Man that drives you around whom you never mention. 🙂 Love to all of you and best wishes for good health and happiness in 2012. That goes for everyone. First of all, let’s get one thing straight. You Are Nuts. Now that that’s out of the way . . . Readers: Kathryn is a friend of mine who lives in Georgia. A stray cat has come into her life, cold and hungry. She fed this cat and of course it keeps coming back. She found the owner and the owner comes and gets the cat, but the cat keeps going to Kathryn’s house because its owner doesn’t feed it well or provide a warm place for it when it;s 19 degrees outside. She doesn’t know what to do. She’s wondering if she should keep calling the owner to come get the cat. I say, no, it’s not her job to make sure this irresponsible owner gets his cat back. What makes this a problem is Kathryn already has enough cats of her own. 100% agreed with John’s comment above! We got over $8,000 worth of dental done for under $900. We got antibiotics $4 for 100 pills, and some other prescriptions at a fraction of the cost! The town was charming, totally safe, but don’t take pics of the Mexican border guard’s butts… just saying. LOL If you want, go to my blog back in Feb. 2011 and find our posts of our two visits to Los Algadones. Also just west of Yuma is a huge huge area of massive sand dunes, tons of weekend warriors with dune buggies, atv’s and toyhaulers. An amazing place!